I’ve been gardening and living in nature for my entire, 29 year, life now and since two years I have started making “Bonsai”. I put “Bonsai” between brackets on purpose because I don’t feel comfortable calling them Bonsai yet especially since the level here is skyhigh thanks to truly impressive members like Walter, Mr Tickle and Pavel, you guys are true masters. Because of that I prefer to call my little guys just small trees. With my background in gardening, some foresting and with two years of bonsai-experience I feel quite comfortable with deciduous trees. I grew up surrounded by them and their way of growing just resonates with me, I understand them, I understand their logic. Pines and conifers however are a complete mystery to me. Their general refusal to backbud on old wood has been a reason to avoid them so far because it limits my choices and I have to make them right immediately from the start. 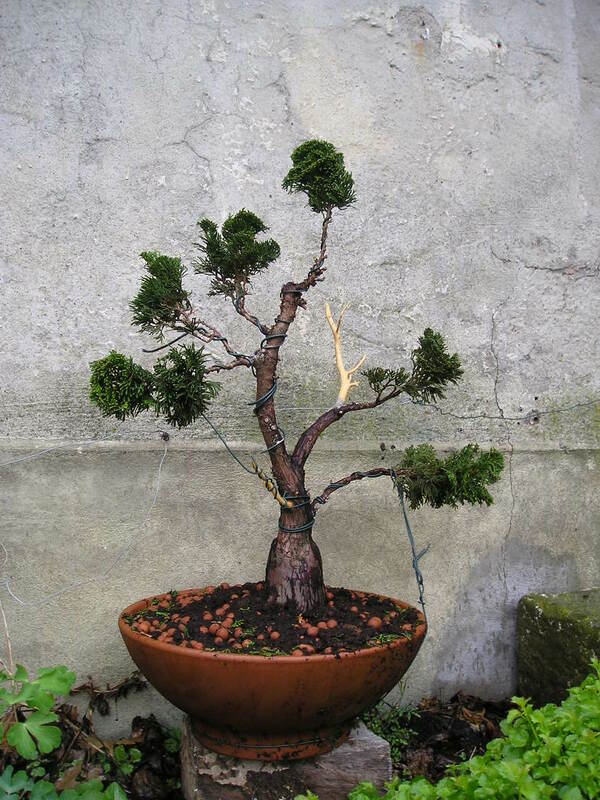 At the same time I strongly feel I should get to know them aswel because bonsai is something I plan to keep doing and developing my entire life. 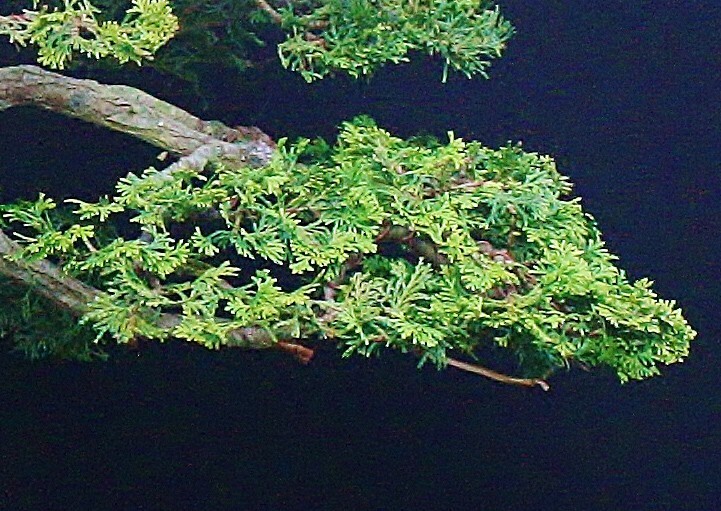 Lately I have been ogling a big Hinoki at a local garden nursery, not grown in any way to become a bonsai but I thought for the money (€30) it’s a nice try. It has a very wide base and a giant rootball so I figured it could make a nice nebari with a tourniquet a few years from now. So I bought it and turned into this, please bear with me, this is my first gymnosperm, also my wiring needs a lot more practice. Usually I prefer selective pruning over wiring whenever I can. The inside of the tree is very empty, I had very little choice, the tree was quite (too) big so it didn’t have any smaller vigorous branches left beneath the thick outer foliage. This is how I imagine it will become in a few years. Am I deluding myself, did I just butcher a nice little tree in vain? I’d love to hear your ideas and suggestions. I'm sorry, but I think I'd have to vote for "butcher." You have left little round pom-poms of foliage way out on the tips of the branches, and this is difficult (many would say impossible) to fix. You can shorten those long bare branches a little by putting several creative (and sharp) bends into them, but that's just disguise. 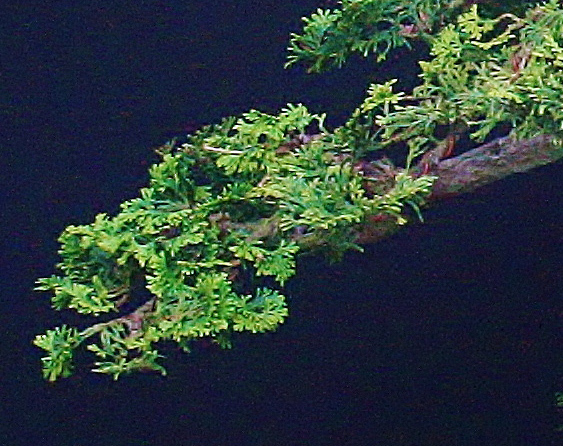 What you need is more green back farther on the branches and that will be nearly impossible; you only hope will be severe pinching of any new growth in those little balls of green in hopes that it will promote some backbudding on the branches. If it does, nurture that green as hard as you can. Jim's correct. However hinoki do not back bud. . . Ever. You can graft new foliage on them though and that is probably the only real option available. Could grow it substantially taller and then the current spacing would eventually look proportionate. That'll take years though. Slow growers. This tree will be good to practice and learn on though so all is not lost . It is a grafted tree and the ball on the bottom gets bigger and rounder over time as it is a much faster growing species, and the step never tapers smoothly so the bulge will never look like a natural trunk. For this reason the tree image will never be as natural as you will hope for in time, another reason why I say use it for practice. You can always try a bunjin style with either the bottom 2 branches on the left or the 2nd from the bottom branch on the right. I would suggest to look for a second one in the gardencenters. Occasionally you will find them without a grafted foot, i takes some dirty fingers to search in all those pots though. Also look for an interesting and tapered trunk with good branch placement and green near the trunk. Following Tim, i show you one of mine from a garden center with natural nerbari. This is a grafted tree that was on show this year in the Netherlands. I pretty much expected I messed up allready. Such a shame, I just love the curly wurly leafpads on Hinoki's. Do not give up on this one yet. As a first step you could go maybe in this direction? See what the tree brings. 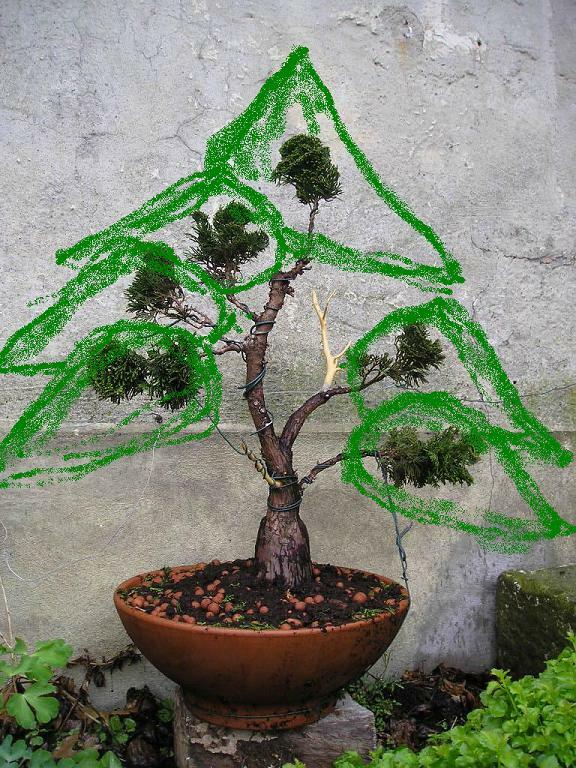 The tree that was on show, (picture above) was at the start also not ideal i think. It is probably repotted this year so give him some time to recover, with a next repot you could look at your soil mix to. I decided to put him in the garden on a tile. If I keep it in a pot I'm sure I'll keep fidgeting with it without progress so I'll set it free to thrive. Maybe in a few years I'll see something new in it. That was probably your best option. Maybe we'll see it again.